Tool Blog News When Is A Stabila Level Not A Stabila Level? When is a Stabila level not a Stabila level? When it is a Masterforce level that is made in Germany by Stabila. That's right, the Menards hardware store line of Masterforce levels are actually made by Stabila. The Masterforce levels look like they are an old model of level that Stabila no longer sells under their own name, but if you go to any large jobsite, you would be sure to see these same level in Stabila yellow. There are a couple of advantages to purchasing a Masterforce level over a Stabila, the first is the obvious price reduction, the second is a no-name level that does not scream 'steal me'. 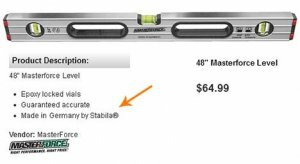 However there might be a disadvantage as well; there is no indication (at least on the Menards website) what the warranty is on these levels. If you are interested in saving a few bucks and you have a Menards in your area, you might want to check these out and see what the warranty is. Menards has the levels in sizes from 16-inches all the way up to 96-inches, they even have many sizes available with a magnetic option.